There’s just something about shooting rimfires. Even with all the cool calibers I get to test out, I never, ever tire of shooting rimfire pistols and rifles. Maybe they just bring one back to the pure joy of plinking. The lack of noise, muzzle blast, and recoil isn’t a bad thing either as you can focus on the pure enjoyment of shooting. Even with the higher prices of rimfire ammo these days, you can do a whole lot more shooting for your dollar. 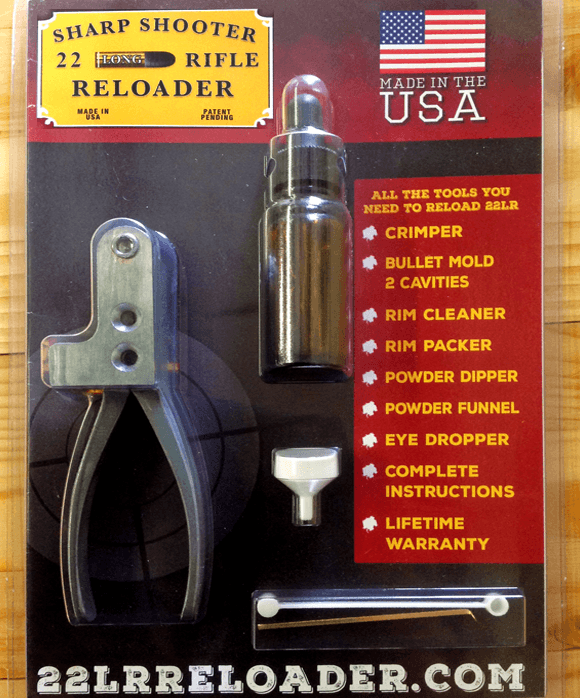 Sharp Shooter .22LR Reloading Kit – yes, you can do this! Yes, contrary to popular assumption, you CAN reload .22LR rimfire cartridge cases. It may not be the fastest and easiest thing to do, but when the world ends and is overrun with unemployed Walking Dead Zombie extras, you’ll be glad to have to this gear. The Sharp Shooter .22 LR Reloader kit includes a pliers-like tool that molds two different .22 bullet shapes and crimps them into place. It also has tools to measure “powder” and clean out the old priming compound from inside the cartridge rim. While you can buy priming compound, that takes all the fun out of the process. Why cheat when you can make .22LR powder from things like toy gun caps and crushed up match heads? I’ve used this kit, melting range bullet fragments in a stainless steel ashtray, and once you get the hang of it, it works. MSRP: $74.95. Not only is the Volquartsen a looker, it shoots the smokin’ hot .17 WSM. While “nailing targets” is a figurative term, it’s more literal with the smokin’ hot .17 WSM cartridge. This beastly rimfire cartridge is derived from a nail gun blank necked down to accept the little .17 caliber bullets. The Volquartsen IF-5 .17 WSM Rifle is all luxury. The laminated stock is a work of art. The receiver and I-fluted barrel are both stainless steel and machined to perfection. There’s a muzzle brake that covers 1/2x38tpi threading if you want to suppress it. I had a chance to try one of these out and tested it with American Eagle Tipped Varmint and Hornady V-Max 20-grain loads; they clocked in at a whopping 2,960 feet per second. Remember, that’s from a rimfire. MSRP: $2,108.50. If you would like to buy a Volquartsen rifle in .17 WSM on GunsAmerica.com, click this link: https://www.gunsamerica.com/Search.aspx?T=volquartsen%2017WSM. CCI Suppressor is optimized to reduce mess and keep the noise down. Since we determined that suppressed .22s are the best thing ever, it’s important to use the right ammunition. CCI has a new offering called, not surprisingly, CCI Suppressor. Yes, CCI has other subsonic loads, and standard velocity rimfire ammo is often subsonic too. 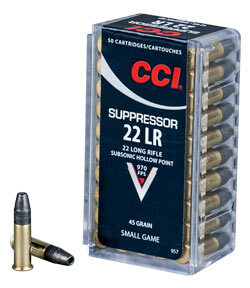 However, the CCI Suppressor Ammo is purpose-built for silencer use. It uses a cleaner burning powder because rimfire suppressors get exceptionally dirty. It also uses a specially designed 45-grain lead hollow point bullet. Not only does the heavier bullet help with semi-automatic pistol and rifle reliability, but it’s also designed to expand at the lower 970 feet per second-rated velocity so you can use this load for quiet varmint control if you like. MSRP: $5.95 per box of 50. For the money, you can’t beat the simplicity and accuracy of the Smith & Wesson Victory. Don’t let the looks of the Smith & Wesson Victory pistol fool you. Yes, it appears at first glance to be the love child of a Smith & Wesson 22 A-1 and a Ruger, but it’s not. This pistol is brilliantly designed in its simplicity. One Allen screw removes the receiver and barrel from the frame, at which point the bolt and recoil spring slide out. It’s the easiest .22 pistol I know to clean and maintain. One other Allen screw lets you change barrels, and the folks at Volquartsen offer a couple of really nifty aftermarket models. With its modularity, shooting performance is stunning. I’ve been using one for over a year, and it is stunningly accurate, even with the standard factory barrel. From 25 yards, it’ll shoot .5 to .75-inch 5-shot groups all day long with regular ammo, not premium match stuff. If you like, you can order models with threaded barrel or Kryptek camo finish. This is a fantastic little plinker. MSRP: $409.00 to $459.00. 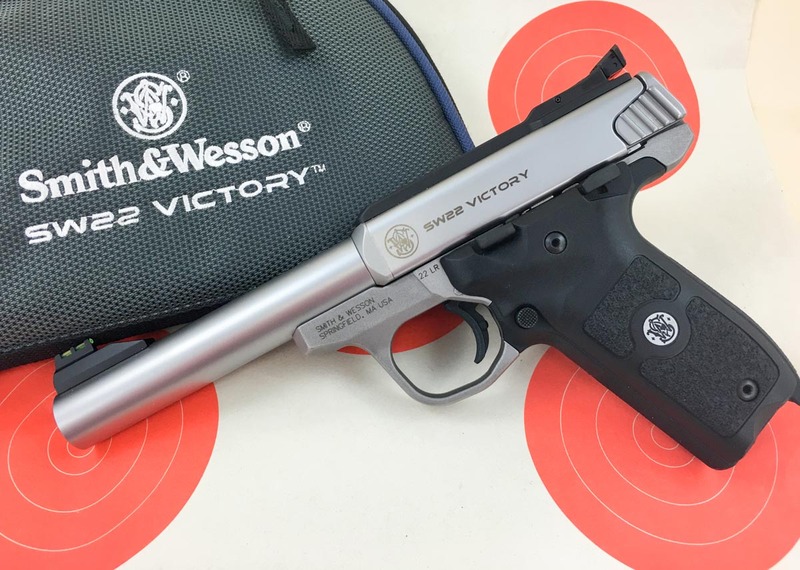 To purchase a Smith & Wesson Victory pistol on GunsAmerica.com, click this link: https://www.gunsamerica.com/Search.aspx?T=Smith%20Victory. Yes, Triumph Systems Pop Packs are fun, but they’ll also exercise your shooting brain. Part of the fun of rimfire plinking is making a big mess, but you really should be training instead of playing, right? Why not do both? Pop Packs, developed by Triumph Systems, help develop cognitive shooting skill and accuracy, but the best part is they explode colorful goo all over when you hit them. Each pack is marked with a combination of three variables: shape, number, and color. 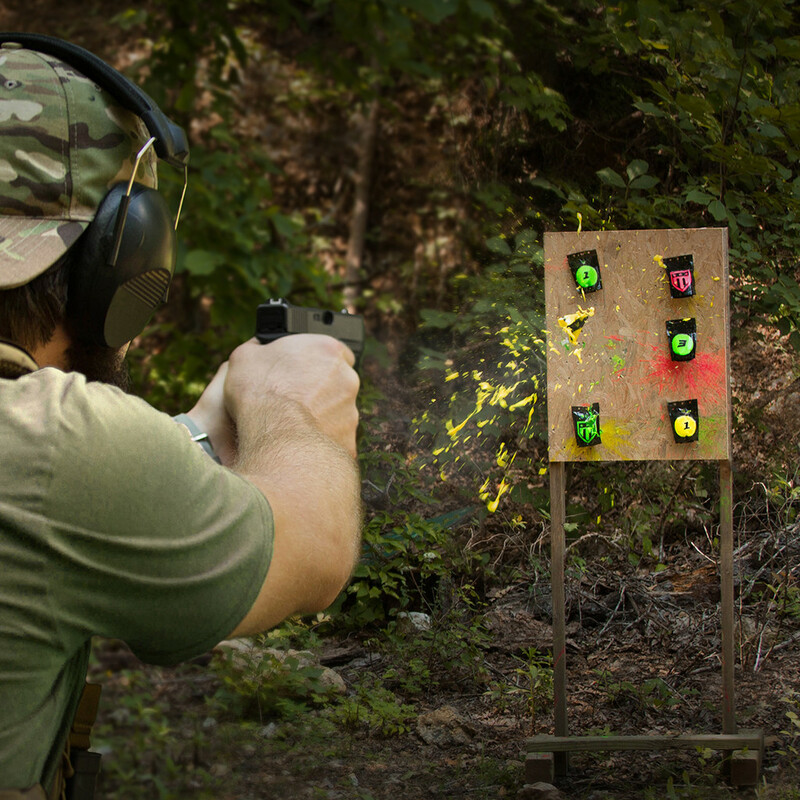 You can yell to your range buddy, “Hit the red ones!” or you can get fancy and say “Get the red triangle number 3!” It sounds easy, but you know what they say about that. Oh, the mess is not only biodegradable but won’t stain clothes or even Danner Mountain 600 boots. Yes, I know this from personal experience. MSRP: $18.99. Volquartsen triggers made the difference for me. A long explanation but only to give you an idea of how I know that is true. I have a stainless 18″ sporter weight barreled Ruger 10/22 bought around about 1998 and a stainless Ruger 22/45 bull barreled pistol with 5 1/2″ barrel. Both have had many thousands of rounds fired through them. In 2013 I used them to compete in a local Rimfire League in both the spring and summer league times after having not fired either one for years. In the spring league both were stock and league rules required open sights, no scopes, red dots or magnification of any kind could be installed on them. I finished near the top, but with no citations in any of the categories. I learned that with the stock sights and trigger on the rifle I had no chance and with the stock trigger on the pistol, although not bad, I couldn’t break the shot fine enough for competition. With aging eyes needing corrections for both reading and distance I wanted to enhance my ability for a fine sight picture against stiff competition against more expensive firearms, often by younger competitors with good eyesight. For the rifle sights I added a Lyman front sight with interchangeable reticles and for the rear sight I installed a Williams adjustable aperture sight to help focus better and extend the sight radius over the standard front bead and barrel mounted folding leaf of short sight radius. The standard front sight on the 10/22 is very fine and with good eyes it might have worked if it had been higher above the barrel. As it was, I had to add a riser to bring it up in line with the Williams. the standard sights were unusable at 50 yards when needing to shoot a round 1″ Xring inside a 11/2″ x 2″ long 10 ring. For the pistol the standard sights are pretty good, with the adjustable rear and fixed blade front both in black. The match would start at 6 O’Clock in the evening and end around 9 pm after dark. Although the range is lighted, such a fine sight picture and sight alignment on small targets at 15, 25 & 50 yards for the rifle and 10, 15 & 25 yards for the pistol. I removed the front standard front sight replacing it with a Volquartsen compensator and standard sight, not for recoil reduction but for the additional weight to steady me during standing free hand pistol shooting. It helped but the sight was too hard to see after sundown or low light conditions in the fall league so I replaced it with a fiber optic front sight with interchangeable sight lights. While a little larger than the factory sight bead, with concentration I could see them better and hold a center impact sight picture that worked, even at 25 yards. The rifle set up was dark with the hooded front sight but he addition of a small aperture disc to the rear Williams sight while using a fine cross hair front reticle with just a toothpick tip dab of fluorescent paint in the center helped defeat the darkness while not increasing size to block. It covered the X in the X ring but I adjusted by aiming center mass between the edges of the 10 ring around it. Now for the kicker that put me over the top. Remember I’m still using a tapered stock Ruger sporter weight barrel and 10 shots each on three targets of different distances had to be accomplished within a few minutes. With five members per team, we had to rotate through three different bench locations to complete the three different target distances, all within 20 minutes. Sounds like a lot of time but not when picking up and moving between each string of 10. Again, precise trigger break was critical as sometimes the shooters in front of you use up too much time and by the time you get on the bench you have less than a minute. Breaking the shot when in perfect sight picture was absolutely critical to post competitive scores. With the standard triggers, despite using Eley Club ammo, sight mods, practice and extreme concentration, I was not consistently hitting top scores. Then I ordered Volquartsen triggers for both the 22/45 and 10/22 Rugers. I installed them myself after careful inspection, lubrication and a brief and probably needed polishing. The Rife now broke at about 2 lbs and the pistol after a little work by me broke a little over a pound. Yep, definitely too light for general use but I was only using these two guns for competition and nothing else. I checked rim thickness on each round, with a Hornady rim thickness gauge, grouped my ammo accordingly, used the best cleaning, lubrication procedures and shooting techniques learned during a career in the Marines and every trick I could think of. In the end while all efforts made small differences, from barely perceptible to definitely documentable, the only modification or technique that gave me the consistency in shot placement I needed were the Volquartsen triggers. The results? While I finished second high average for the season with the rifle and nothing short of Lasix surgery on my eyes is likely to improve my ability to see at 50 yards with fine open sights, I took both High average pistol and single highest score with the pistol. The only other possible modification I might make if I were to compete again would be longer fluted bull barrel on the rifle to prevent heat sinking and barrel flex due to heat and harmonics. (I had channeled and free floated the Ruger laminated wood stock earlier). Due to a bad back that hates standing with a heavy pistol at arms length for extended periods of time, I probably won’t compete in standing open sight pistol again. But, I’m looking forward to passing my knowledge and passion for shooting and competition along to the grandkids and I plan on starting them with those two Ruger’s. I beat younger, older, active duty Air Force shooters form the local base and people using much more expensive equipment like Smith & Wesson model 41 target pistols, revolver and 1911 platformed heavy barrel custom made bullseye .22 pistols; CZ & Savage long barreled target rifles, a Remington X40 heavy barrel, all with factory competition adjustable sights, long barreled Ruger target pistols, several others I can’t remember and even a Hammerli 208. The difference for me was the Volquartsen triggers allowing me to call my shot break when the hold was spot on. And no, I have no relationship with them. None. I get nothing from using their name. A long story I know and I’m not saying no one else could have made an equal or better trigger. I am saying I tried every trick in the book, too many to list here, and the precise trigger control I got from the volquartsen triggers was what took me over the top in pistol and a good feeling 2nd place in rifle. The rest got me close, but without the trigger improvements I wouldn’t have finished the season in 1st one and 2nd for pistol and rifle, respectively. Volquartsen products are costly and I do have never held a rifle made by that company. Some of the pistols are to gaudy for my taste but there are plenty of after market accessories that dress up some of the Rugers that California compliance ruined. There is plenty to like about Volquartsen. I am not sure if I will ever be ready for reloading rimfire ammunition. Maybe, with Trump as President, ammo cost and availability will change for the better for both the consumer and manufacturer. GollyGee I could have bought a NICE AR & SCOPE ( 3+ ) for less than ONE Volquartsen IF-5 .17 WSM Rifle $2,108.50. 20-grain loads; they clocked in at a whopping 2,960 feet per second. Compared to A 40gr 223 at 3800fps ! V-MAX Hornady Varmint Express Ammunition 223 Remington 40 Grain V-Max boxer primed, reloadable brass cases. Why can’t one use 35 to 40 grain .223 bullets in your make-it-yourself .22 reloading kit? It seems as if it would save the trouble of melting down lead to roll your own. A .22LR has a under cut healed base on the bullet.. the end result is the bullet diameter is the same as the outside of the brass. A .223 slug pushed into a .22LR brass would over swell the brass almost .025″. If it would chamber your gun is totally worn out. LOL to much time on your hands ! To Cheap to have bought CASES of CCI when it was $12 a brick / $120 a case of 5000 ! A smart man would use 22lr cases to make jackets for 223 bullets !